discoverPorlezza.com - Travelling to Porlezza. With trains from Milan to Lugano, Porlezza or Varenna and the road from Malpensa, you have the best of both worlds. You will need to use different means of transport however to complet your trip. There is a regular shuttle service from the airports Milano Malpensa and Milano Linate to the Central Railway Station of Milan. 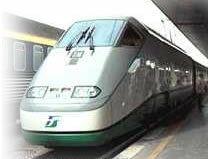 The fare from Malpensa to the central station is about 7 euros, and that from Linate to the station is less than 3 euros. From the central station there is regular train service to Varenna described in the schedule given below (correct at time of writing). From Varenna you will need a ferry to Menaggio and then follow the road instructions below. Alternatively you may take the train to Como. The nearest major Air Terminal for Porlezza is Milano Malpensa International Airport and more recently Bergamo Airport. To arrive from Malpensa or Bergamo you should ideally hire a car or alternatively take the airport shuttle bus to Milan and then a train to Varenna or Porlezza itself. Driving from Malpensa or Bergamo to these towns should take around 1 hour depending on the traffic. Air travel can be quite inexpensive these days and its will pay to check out the cheap carriers for special deals. For UK flights, Stansted, Bristol, Glasgow can provide cheap and convenient flights for that special break. to Porlezza. This road leads onto Cima, Cressogno, Valsoda, Oria (Italy) and into Gandria (Swiss) across the border. From Linate, take the A1 toward Monza, then the A4, West, then join the A9 North toward Switzerland and Porlezza. Follow the same directions as above, but distance is approx. 80km. After this take the lake road to Argegno and then the SP14 to Porlezza. From Bergamo, take the SS342, North West toward Lecco, then join the SS36 and turn off this autostrada to Varenna and Mandello. Distance is approximately 55Km. You will need to take the ferry across to Menaggio from here. Lake Lugano can also be approached from Switzerland through San Bernadino or Splugenplass and then along the lake roads, or can be approached through Chiasso, after going through the San Gotthard tunnel. This Swiss border is only a couple of miles from Porlezza city. We suggest you study the map carefully, the route is very simple and Porlezza city is just before the Swiss border. There are tolls however and a few Euros may be necessary to navigate them. Italian drivers are famous for their casual approach, this combined with the narrow dual carriageways and link roads means care needs taking at all times. There are Private and personal services to the Lakes. One we know of with their own website is FLYTOLAKE.COM Thye only travel to Bellagio and Lecco, may provide more tailored solutions. ALso try their other website Lariobus. Steamers, boats and buses all serve the lake with good connections to towns and villages all over Lake Lugano. You will need a passport however if you intend to travel into Switzerland, by road or boat! This is by far the best way to see Porlezza and Lake Lugano. Roam the old streets, do some serious shopping (Lugano)hike up the local hills and you can relax in the cafes or dine in a traditional Italian restaurant with local wines and produce. Take the Ferry! !